The term Anthropocene denotes a new geological epoch characterized by the unprecedented impact of human activities on the Earth’s ecosystems. While the natural sciences have advanced their understanding of the drivers and processes of global change considerably over the last two decades, the social sciences lag behind in addressing the fundamental challenge of governance and politics in the Anthropocene. 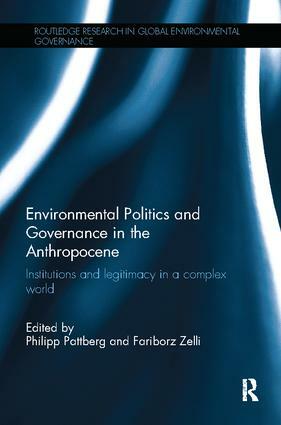 This book attempts to close this crucial research gap, in particular with regards to the following three overarching research themes: (i) the meaning, sense-making and contestations emerging around the concept of the Anthropocene related to the social sciences; (ii) the role and relevance of institutions, both formal and informal as well as international and transnational, for governing in the Anthropocene; and (iii) the role and relevance of accountability and other democratic principles for governing in the Anthropocene. Drawing together a range of key thinkers in the field, this volume provides one of the first authoritative assessments of global environmental politics and governance in the Anthropocene, reflecting on how the planetary scale crisis changes the ways in which humans respond to the challenge. This volume will be of great interest to students and scholars of global environmental politics and governance, and sustainable development. Philipp Pattberg is Professor of Transnational Environmental Governance at the Institute for Environmental Studies (IVM), Vrije Universiteit Amsterdam, The Netherlands. Fariborz Zelli is an Associate Professor at the Department of Political Science at Lund University, Sweden. Global environmental governance has been a prime concern of policy-makers since the United Nations Conference on the Human Environment in 1972. Yet, despite more than 900 multi-lateral environmental treaties coming into force over the past 40 years and numerous public-private and private initiatives to mitigate global change, human-induced environmental degradation is reaching alarming levels. Scientists see compelling evidence that the entire earth system now operates well outside safe boundaries and at rates that accelerate. According to a recent scientific assessment organized by the international Earth System Governance Project (ESGP), human societies must change course and steer away from critical tipping points that might lead to rapid and irreversible change, while ensuring sustainable livelihoods for all. The urgent challenge from a social science perspective is how to organize the co-evolution of societies and their surrounding environment, in other words, how to develop effective and equitable governance solutions for today’s global problems.